Funnily, I kept getting a Spanish card game when looking for a definition of OMBRE to grab and add. Anyway, this will be super quick and I’ll come back to add some more samples and possibly do a Recipe Card, but I just thought it was kinda nifty. I’ve tried to control the roll, IYKWIM, keeping paint on the Gelli plate in a straight line, but it just never seems to work out for me. Maybe you are better at it than I am, but it never looks as smooth on the plate as it does when I do this. More Fun Foam – is this just a wonder product or not? 1. Get a sheet of Fun Foam. 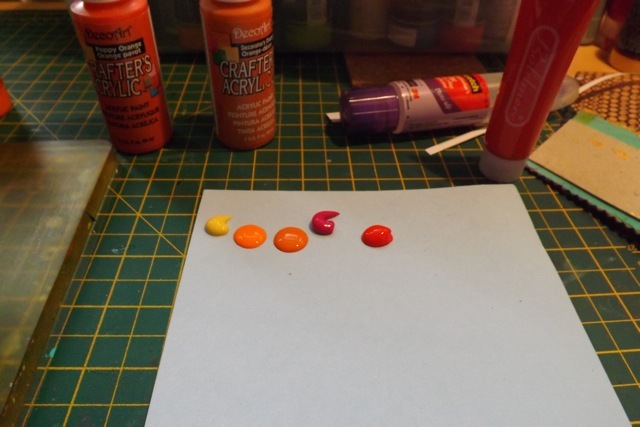 Apply dots of paint along the top edge. Ideally the width of the paint should pretty much match the width of your brayer. 2. Roll smoothly, top to bottom, spreading the paint in a straight line. See how the brayer is loaded? 3. Brayer the paint on to the pad, also in a straight line. Use whatever Gelli technique you like. Here, a stencil. A few points to note: First, the paint stays wet on the foam for a bit. That means you can do multiple columns of colour, keeping the order the same. So for a larger plate you can roll on the paint and create a repeat – or you could do light to dark, then do the first column, rotate the plate, then do the next column, matching the dark colour in the middle. I am struggling to explain this in words and it is one of the samples I want to do, a picture being worth 1000 words and all that. I have to dash off to a meeting, but I am loving the look of this, and I hope you do too. Looks like so much fun! 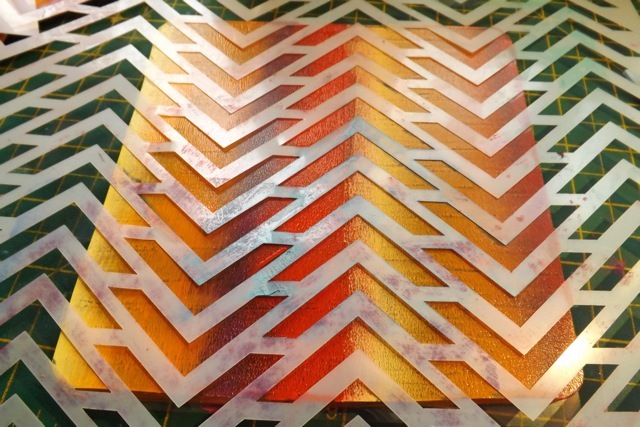 Next time I break out my gelli plate, I am definitely going to give this a try! 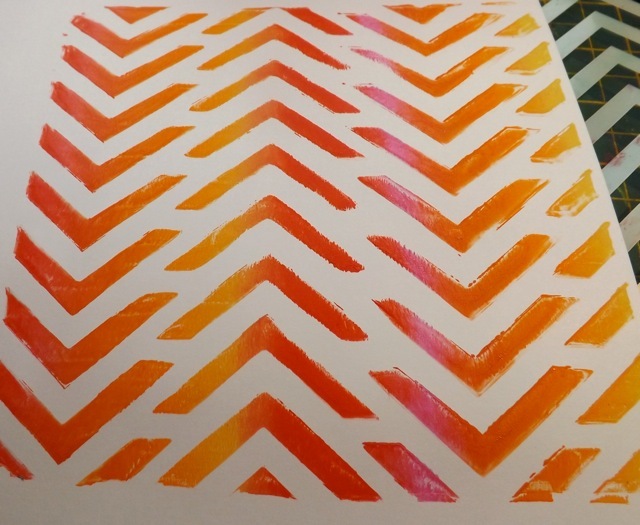 If you add a small dot of blending gel to each dot of paint and then brayer as usual the paint will stay moist longer and you can get more pulls of each design. 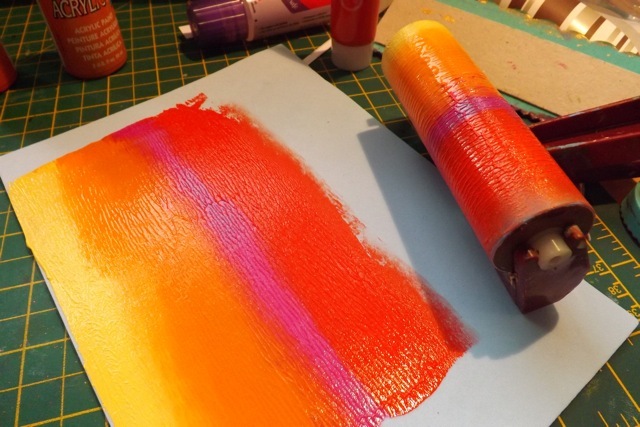 Haven’t given in to the temptation to buy a Gelli plate yet but I love the results you get, and these colours are fab. Would work just brayering on card as well, which is what I am going to do. Thanks for sharing, and for visiting my blog as part of WOYWW (not had chance to get round all the sites yet but I’m trying hard.